Prior to the August 18th Marriott Mergerpocalypse I talked myself into reaching for Platinum Premier 75-night status. And, I’m getting close. I see the end in sight. I have 70 nights “on the books” and a plan for earning the last 5. The argument in favor of going for Platinum Premier 75-night status in 2018 begins with this: starting next year, holding more than one Marriott/SPG card won’t help to achieve status. Next year, you can get at most 15 elite nights credit regardless of how many cards you hold. But this year is different. Those who had the Marriott Premier consumer and business cards and the SPG consumer and business cards prior to the August mergerpocalypse got a total of 40 elite nights towards status (15 nights from each Marriott card and 5 nights from each SPG card). So, this year only, it’s possible to get to Platinum Premier 75-night status with only 35 elite nights above those from the credit cards. Starting next year, regular Platinum 50-night status will require 35 elite nights above the 15 granted by your credit card. The next part of the argument for pursuing Platinum Premier 75-night status this year is the hope for a future soft landing. If I were to achieve Platinum Premier 75-night status now, that status would last the rest of 2018, all of 2019, and through February 2020. Then, my hope is that Marriott would “soft land” me down to Platinum 50-night status which would presumably last until Feb 2021. That was all a long way of saying that 35 nights earned this year might be enough to get me multiple years of high-level status. Shortly after the merger, my online account showed that I had 49 elite nights: 40 from credit cards and 9 from actual stays. Those elite nights were previously split between Marriott and SPG hotels but now they were added together. I was surprised to see only 9 “real” nights in my account, so I did some digging. I found that I hadn’t been credited for one of my stays. I submitted a missing stay request online and a few weeks later the two missing nights were added to my account. My wife and I had planned a mini vacation in Sedona where we stayed in the Sedona Kimpton (which was a bit of a disappointment compared to other Kimpton hotels we’ve enjoyed, but we loved Sedona overall). But we cut our trip short when we learned that our last day would be completely rained out due to a tropical storm headed our way. We checked out a day early and drove down to Phoenix where there is more available to do indoors (we spent the afternoon in the awesome musical instrument museum). 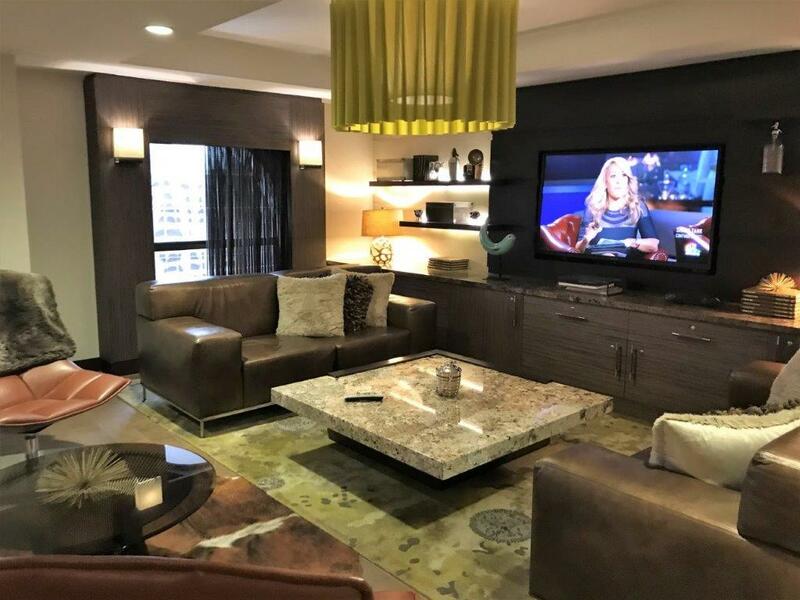 I used a Marriott 25K free night cert to stay at the Renaissance Phoenix Downtown Hotel (which was selling for over $600 per night at the time) where we were upgraded to a junior suite and enjoyed their gorgeous executive lounge. Since I blog for a living, I can work from anywhere. So, when my wife’s work takes her to interesting places, I often follow along. And, I often add my loyalty number to her work-related hotel bookings so that we’ll both enjoy elite perks during the stay and so that I’ll inch my way closer to the next level of status. One such stay was at the Residence Inn Downtown Charlottesville. Wow. The hotel is stunning and in a perfect location. I loved this short stay. Unfortunately I apparently didn’t take any photos of it! St Pancras Renaissance London junior suite in the exclusive Chambers wing. We’ve stayed in this exact same room before. It doesn’t get old. 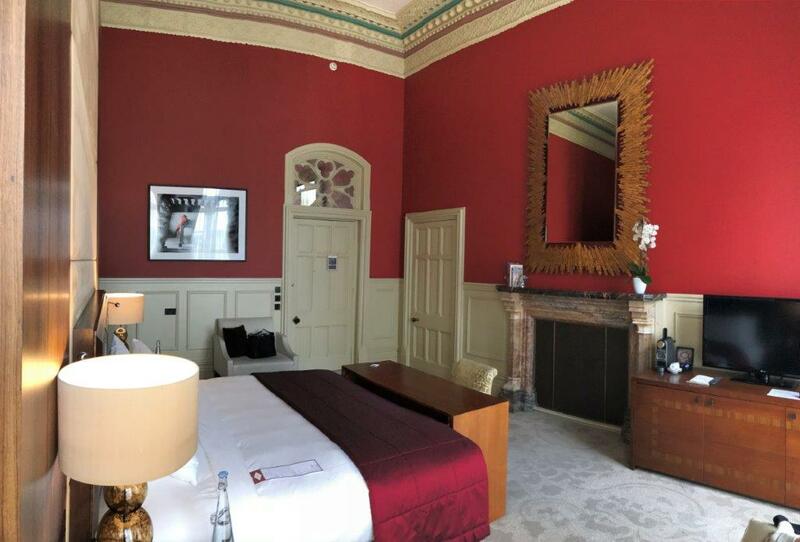 We just completed a seven-night stay at the St Pancras Renaissance London. London has become one of our favorite cities and so we’re lucky that my wife is frequently invited to meetings there. We had a great time staying at our favorite hotel, going to shows (loved “Everybody’s Talking about Jamie”), as well as visiting friends and relatives. We have two more stays booked before the end of the year: one for three nights and one for 5 nights. Rather than mattress run for these final five nights, I’ve decided to select Five Elite Night Credits as my 50-night Platinum Choice Benefit. It took me a while to find out how to go about doing this (I never received an email from Marriott about reaching 50 nights). Finally, I found the URL: choice-benefit.marriott.com/en-us/marriott-rewards/benefits. If you have earned 50 and/or 75 nights, you can go to that URL to select your Choice Benefit. This was a tough call since I think that 5 Suite Night Awards (SNAs), which is another Choice Benefit I could have picked, has the potential of offering more value than 5 elite nights. That said, SNAs have some severe limitations: the way SNAs work is that the upgrades are not confirmed until, at best, 5 nights before your stay. Plus, you must use the exact number of SNAs to match your length of stay. For example, if you have a 7-night stay but only 5 SNAs, you can’t ask to upgrade 5 of the 7 nights. You would have to break your reservation into two to accomplish that. Anyway, by picking the 5 elite nights, I should then reach 75-night Platinum Premier status whereupon I’ll be able to select another Choice Benefit. Maybe I’ll choose 5 SNAs at that point. I have mixed feelings about the Marriott / SPG program overall. The merger was (and in many ways continues to be) a disaster. That said, while some SPG benefits decreased (especially their credit card earnings), many Marriott benefits got better, and their overall footprint increased. Now, more than ever, Marriott hotels are likely to be pretty much wherever you need a hotel. And, in some cases, I believe that Marriott truly has better options than their competition. So, even if I prefer Hyatt (and I do), and even if Hilton is a more than worthy competitor, I know that I’ll continue to spend time in Marriott hotels in the future. And, when I do, I like the idea of having at least Platinum status in order to snag the occasional suite upgrade, get access to the lounge when it’s not closed on weekends, etc. Hopefully, my gambit will pay off and this spurt of Marriott stays will mean that I’ll have at least Platinum status through Feb 2021. At the very least, I know I’ll have Platinum Premier through Feb 2020. Then, when I dip below Platinum in March of 2020 or 2021 (depending upon whether or not I get a soft-landing to Platinum), I can decide what to do. Should I bother trying to get status again? I doubt I’d do so with 35 nights again, but maybe I could sign up for a Platinum challenge or spend $75K on either the SPG Lux or Ritz card (if the latter still exists by then). Or, most likely, I’ll simply stop chasing status with Marriott. Thanks for posting the link for the choice benefit. This was a great article. I have 70 nights as well. So I will follow you with the 5 elite night benefit to finish off the year. Thanks for the great write up. If you spend $75,000 by the end of this year, you should have Platinum status through February 2020. That’s because you’d be earning this year for 2019 status, and 2019 status expires in February 2020. Thank you for posting this! We are in the same situation. I hate that I still have six suite nights to use before Dec. 31 (from 2017) so using the five nights toward status may be what I do. Never could find the link either to select. No email, acknowledgement after hitting 50 nights this year. I’m right with you, Greg – in my quest for Plat Premier and my thoughts about the program. Just hit 81 nights (and Plat Premier), so I’m a little ahead of you. With still 6 award nights and 15 elite nights from a credit card renewal coming this year, I will be well over 100 nights by year’s end. But Marriott qualified spend is only about $2,500 (well short of $20k for Ambassador status). In the end, for me it’s about the hope for a soft landing and Plat status through Jan 2021. Even this year, I did not have 35 nights in a Marriott bed, so re-qualifying again is unlikely. That’s why I have the IHG, Hyatt and Hilton Aspire cards (fingers crossed that Hilton does not degrade the Aspire card’s best in class benefits – probably will happen, but a guy can hope). I expect Marriott to start to fade (unless they change the program) come Jan 2021 – but that’s a good way off for now. Sorry if this is a newbie question or already answered in another one of your posts. I have 29 nights with SPG and 36 nights with Marriott with have stays planned on both properties before the end of the year. I plan to hit platinum elite status one more time with 25 stays at SPG and have been afraid to combine accounts until doing so since stay credits won’t help toward status next year. Do I just need to go ahead and combine my accounts and trust that the system will recognize it when I hit 25 stays at SPG and renew my status? I hope this makes sense. Thanks very much. I’m not sure what the advantage is to hitting 25 stays. If you combine your accounts then you’ll have over 50 nights which will make you eligible for choice benefits. Am I missing something from your example? Thanks, Greg. You’re not missing anything! I think I just got confused. I had “25 stays” in my head because 50 nights seemed way out of reach. I had a long stay which shot my nights up over 50. I’ll combine pronto. Love your site–you and your team are always very informative and I’m learning–slowly but surely! Happy Thanksgiving! They’ve always done so in the past, so I think the chance is high. On the other hand, they recently took away elite night rollover and elite buy back, so it’s possible that they quietly took away soft landings too. Pretty much exactly what I’ve been doing except by happy accident my wife’s stay on my travel package got me six nights so I didn’t have to use my plat choice for 5 nights and MS another night on my old Marriott personal. Note that, at 75 nights, one of the choice benefits is a free night cert, good for over a year, on any room up to 40,000 points. For me, much more valuable than 5 suite nights. That’s a really good point. Depending upon the situation I might value 5 SNAs more, but the free night cert would certainly be easier to use. That must feel great! I opted to follow your Hyatt roadmap and use their credit card spend to get my Globalist. My last 4 nights will come with the next statement December 16! 13 nights credit from paying with points and 47 from the credit card. I know I know opportunity lost but Paris and Milan will make up for that ands I’m very hopeful that Small Luxury Hotels will bear fruit! Thank you for all your posts! The fifty nights choice benefit — is there a certain time frame that one needs to follow in selecting it? Fine print, but the whole program is much too complex for me. Are you saying that you both got credit for the stay??? That’s a new one. As long as one of you is elite, you get all the benefits whether it’s you or your wife who made the res. No, only I get credit for the stay. The point is that she often has other people book her stays, so I call and add my number to the reservation. How does holding credit cards and getting elite nights work? I have had the SPG Business card since Fall of 2017. I had the Marriott Premier and SPG personal cards during last year, but cancelled both in August. How many elite nights should I get from having those? Looking at my account it shows 27 bonus nights: 12 Rewards credit cards, 10 reward events and 5 rollover nights from 2017. Is this accurate? I’ve tried contacting Marriott to inquire and don’t get very far. It sounds to me like you got credit for five nights each from the SPG business and personal and you must have done $6,000 in spending on your Marriott card to picked up two more elite nights. Unfortunately, it sounds like you cancelled your Marriott Premier personal before the anniversary date. The 15 nights of elite credit don’t post until your anniversary date. If you had kept the card open past your anniversary date this year, you would have 15 from that card alone. Then you’d have another 10 from SPG cards. With your event and rollover nights, that would be 30. However, I don’t think there’s a way to go back to that if you cancelled in August. What if you had the Chase Ritz Carlton Card and the Chase Marriott Premier Business card – should I be getting 15 nights of elite credit for each of those cards (30 nights total)? The Ritz-Carlton card doesn’t come with elite night credit. To clarify, it will in 2019. But you’ll only get 15 nights from one card. Do you think I could product change from the Ritz card to the Marriott personal card (which I dont have) in 2018 and get 15 elite nights in 2018? I’ve got 58 elite nights and I’m trying to think of ways to get to 75 nights. Nevermind. I think I’ve answered my own question. It looks like the Marriott Premiere Plus personal card doesn’t provide 15 elite nights until 2019, so if I product changed to it now, it wouldn’t do me any good in 2018.